Psychologists and child care experts believe that puzzles and other similar toys can help develop a child’s cognitive skills particularly his or her convergent thinking and problem solving skills. In like manner, animal developmentalists say that using puzzle toys in dogs can have almost similar effects, although the manner in which the outcomes are measured can vary somewhat owing to the inter-specie differences between man and dog. Regardless, the mere fact that dog puzzle toys can help shape their cognition, this can have far-reaching implications in their trainability and social interaction capabilities. It is thus, highly recommended to provide your pooch with dog puzzle toys to help it become a more well-rounded pet. And if you’re wondering what constitutes smart dog toys, we’ve prepared 10 best dog puzzle toys to keep your dogs busy and help them harness their canine intelligence. 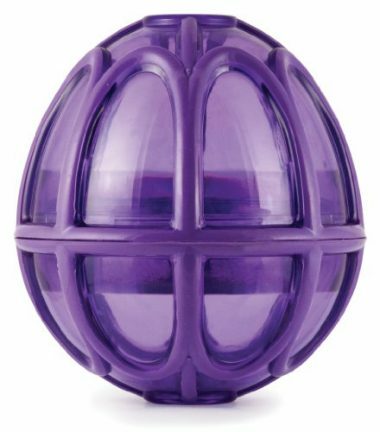 Shaped like an egg but with a heavier bottom, the Busy Buddy Kibble Nibble Meal Dispensing Dog Toy is designed to help dogs learn how to slow down with their chow while also giving them the opportunity to turn mealtimes into playtime. The heavier bottom ensures the Busy Buddy stays upright unless your pooch will be swiping at it to release some of the dry kibbles that are placed inside. It also comes with large-enough spaces so your pooch has the option of inserting its tongue to get a kibble or two. Personally, we believe this approach will be less efficient than simply knocking and rocking the Busy Buddy to and fro. Hopefully, your canine friend learns this, too. Made of an indestructible material, the Furry Fido Interactive Dog Toy is an exceptional choice for those who would like a beefed-up treat dispenser. The Furry Fido is designed to elicit a rather interesting sound every time your pooch attempts to chow down on it. This arouses their curiosity, enticing them to play with the Furry Fido for a lot longer. This can help reduce boredom from doing nothing while also allowing pooches to enhance their simple problem solving abilities. But there is actually another amazing plus in the Furry Fido. Since the surface of the ball comes with ridges or nubs that are shaped like miniature bones, chewing down on the Furry Fido can help remove trapped food particles on your dog’s teeth and gums. This makes the Furry Fido a great dental chew as well. 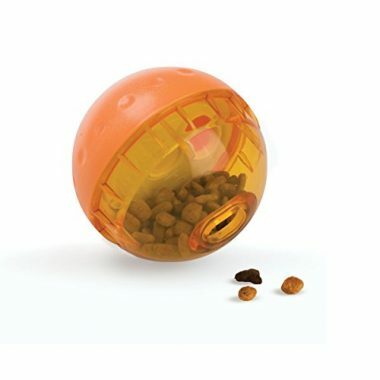 Milk-Bone’s Treat Dispensing dog food puzzle toy is a lot similar to the IQ Treat Ball in that doggie treats can be placed inside and, as it bounces or rolls, these treats are released through the spaces in the ball. The concept is simple enough and should make for a great way to play ball with your pooch. While this dog puzzle feeder works best with Milk-Bone biscuits, we can only surmise that other brands and types of doggie treats can work, too, as long as they are not too small that they easily escape through the spaces and are not too large that they won’t fit. 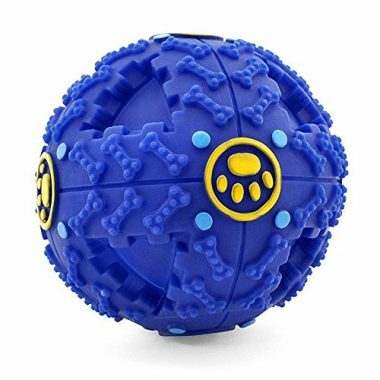 If your hound is simply fond of playing with balls, then the IQ Treat Ball can be a much better alternative to your ordinary ball. 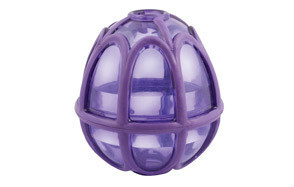 This ball-type dog food puzzle is more like a hamster ball that comes with translucent and opaque hemispheres. The translucent hemisphere should help pooches get a glimpse of what is inside, enticing them to figure out how to remove the contents. The opaque hemisphere practically covers the treat, giving the impression that the treat has suddenly vanished. This naturally arouses canine curiosity, making your dog to swipe at the IQ Treat Ball. Sooner or later, your doggie learns that by rolling the ball, treats will come out from the ball. This helps train your pooch to work for its treat. When used early on, your doggie will learn that it will have to work to get its food. Surprisingly, the IQ Treat Ball is well-received by dog owners everywhere. It can be easily twisted open so you can clean the inside surfaces prior to refilling. It is quite rare to meet a dog owner who doesn’t know or hasn’t heard about KONG and its indestructible dog chew toys. 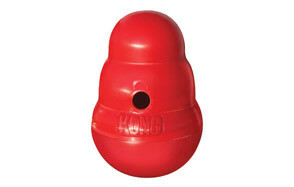 The company is primarily known for its classic KONG treat dispenser. 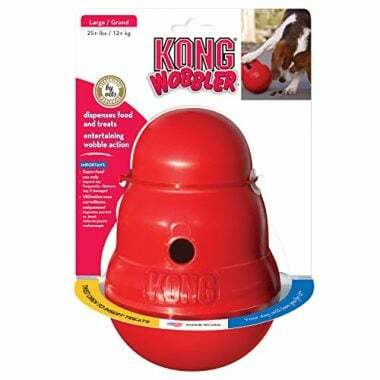 Technically, the Wobbler is pretty much like the Classic KONG except that its treat dispensing hole is not located at the top of the chew toy. Instead, a larger hole is located on the middle section of the Wobbler. The idea is for the Wobbler to be standing firm on its bulbous base. To retrieve a treat, your dog needs to claw it so that it ‘wobbles’ allowing some of the treats to escape through the hole. The Wobbler may not really be classified as real dog puzzle toys, but they sure can be exceptional tools for preventing rapid eating in pooches. Since dry kibbles can only be accessed by wobbling the Wobbler back and forth to ‘eject’ some of the kibbles from the hole one at a time, it will definitely take a longer time for your pooch to finish its meal. That simply means the Wobbler can be excellent for portion control and for managing canine obesity. West Paw’s Zogoflex Qwizl is a treat dispensing contraption that doubles as a chew toy. Made of indestructible materials that can withstand the bite force of even the most tenacious of all canine chewers, the Zogoflex Qwizl comes off as having a very simple design concept yet does the task of training your pooch to work for its treat. It is as easy as inserting your dog’s favorite treat inside the middle of the bone-shaped contraption with the ends of the treat sticking out from the tips of the Qwizl. Slots in the middle allow the scent of the treat to escape, further stimulating dogs to try to get the treat out. While the surface of the Zogoflex Qwizl smart dog toys don’t come with nubs or ridges which can help with the removal of dental debris, its flexible and indestructible nature, nevertheless can easily turn it into an amazing chew toy for your pooch. If you’re a fan of slide-to-reveal puzzle toys, then you’d want to get Spot’s Seek-a-Treat Interactive Shuffle Bone Dog Toy Puzzle. 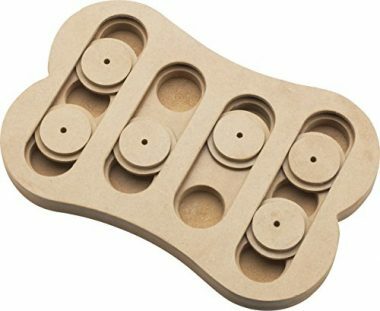 Shaped like an oversized doggie bone, the Seek-a-Treat dog food puzzle contains 4 slots each with holes and ring sliders. The idea is to fill one or two of these holes with treats and leaving another hole as empty or any other variation you can think of. The point is to train your pooch identify which hole will contain the treat. It will also have to learn how to move the slider to open a hole underneath. The Spot Seek-a-Treat is made of eco-friendly wood, making it a great choice for those who may hate plastic toys for their pooches. It is also available in 3 sizes so you’ll definitely have something more appropriate for your doggie. Call it your canine friend’s most challenging dog puzzle feeder system ever. That is exactly what the Trixie Pet Products’ Strategie-Spiel Flip Board really is. Imagine a food tray with partitions and in each partition is a kind of covering that dogs will have to learn how to ‘uncover’ to retrieve the treat that is placed in the partition. Lids can be flipped using knobs while disks can be slid open. Cone covers can also be lifted up. However, your dog will have to learn how to perform these correctly. This is a lot different from treat dispensing toys since the Strategie-Spiel requires pooches to figure out how to manipulate the various covers to reveal the doggie treat or food inside. Since there are plenty of partitions with various lids or covers, you can increase the level of difficulty of the food-seeking challenge by simply determining which of these partitions will contain the treat. Another wonderful feature of the Strategie-Spiel is that it is designed in such a way that opening the covers the wrong way will never spill the treat outside the dog food puzzle toy. 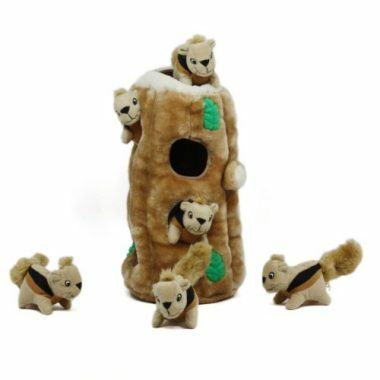 The Hide-a-Squirrel and Puzzle Plush Squeaking Toys for Dogs is simply the best dog puzzle toys in the market today if one is going to base it on the sheer volume of positive reviews. A closer evaluation of what makes the Hide-a-Squirrel such a huge hit among dog lovers will reveal that it actually appeals to the innate nature of pooches to run after their natural ‘prey’. The Hide-a-Squirrel is just one of 4 variants produced by Outward Hound primarily intended to arouse the curiosity of canines and encourage them to use their inherent intelligence to ‘sniff’ out these preys in their hiding places before ‘snuffing’ them out for dogs to play with. If one doesn’t like the idea of a squirrel, then maybe Outward Hound’s bee, hedgehog, or bird variants should do the trick. Each of these plush animals is fully embedded with a squeaker that will elicit a characteristic squeal once your pooch has it in its mouth. The plush tree stump comes with holes for you to insert these plush furry preys in. And if your dog is already bored with the usual hide and seek kind of game, then maybe playing catch with it using these pet-safe plush toys should do the trick. In this section of our post on canine puzzle toys, we will be looking at the reasons why our pet dogs seem to love puzzle toys. We will also try to gain an understanding of the different benefits afforded by these contraptions. Towards the latter part of this section, we will explore some of the ways in which you can teach your pooch to use a puzzle toy including the things that you will have to consider when picking the best dog puzzle toy. Why Do Dogs Love Dog Puzzle Toys? We all know that children love puzzles. It’s also known that many adults still play with puzzles to help kill time, ease their minds, or even to sharpen their thinking skills. But do dogs really love puzzles? To answer this question, it is important for us to travel back in time when our dogs were not really domesticated yet. In the past, ancient dogs had to hunt for food for them and the pack to survive. They covered great distances in search of their next meal. Through generations of canids, this innate ability to distinguish the scent of ‘food’ or, in this case, prey has been fully ingrained into their genetic composition. Without it, dogs simply cannot survive in the wild. Even those that belong to a pack will have to contribute something for the benefit of the group. This survival instinct is even greater in those canids that have been considered outcast by any dog pack. f they don’t sharpen their hunting skills, they will starve. If they starve for so long, they will die. It is in this hunting instinct that dogs’ love for puzzle toys is deeply ingrained. These canine toys are vastly different from the puzzle toys that we humans use to develop our cognitive abilities. Canine puzzle toys utilize food as a means to ‘awaken’ the natural predatory instincts in dogs. When pooches smell the scent of a kibble or a doggie treat inside these contraptions, they will make numerous attempts to get to the treat or the food. It may be hidden from view by a lid or a cover so they will have to learn how to open or remove such cover. For us, it is more like trial and error. But for dogs, it is simply survival. If you’re interested in giving your pooch a puzzle toy but are simply not convinced whether this type of canine device can bring any measurable or even observable benefits, then allow us to share with you what many dog owners and pet experts consider to be the most compelling reasons why you need to give an appropriate puzzle toy to your dog. Exercise is important for the optimum wellness of any pooch. Equally important is exercising the brain. While our idea of physical exercise entails the rhythmic contraction and relaxation of muscles, mental exercises require the more efficient firing of various nerve cells in the brain. The more neurons are activated for a particular task the better it is for the canine brain. There really is only one way to make sure a lot of neurons are activated and that is by providing a variety of stimulation. The use of canine puzzle toys has been proven to improve the brain development of dogs as these activities help provide adequate mental stimulation. Did you know that hunting actually entails a lot of problem-solving processes? It all begins with a problem that needs to be answered with a solution. When dogs feel hungry, it is a problem. The solution is to eat. But, since there is no food to eat, it becomes a problem. The solution is to look for food. Looking for food may be easier said than accomplished so this makes it another problem. Dogs, then, will have to find ways on how to make it a lot easier to hunt for food. This is a very simple process yet it is filled with a lot of problem-solving activities. Giving your pooch the best dog puzzle toy can help enhance these problem-solving skills. 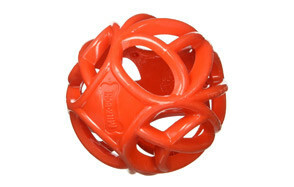 We mentioned above that canine puzzle toys are predicated on the understanding of dogs’ innate nature to look for food. Having said that, did you know that you can actually use dog puzzle toys in portion control? Since food is placed inside these puzzles and that these are designed to release food slowly or sparsely at any given time, then you are essentially addressing fast eaters and overeaters. By making your dog work for its food, you are able to limit its food intake or even slow down its ingestion and digestion of food so that abnormal blood sugar spikes can be avoided. This can lead to a more sensible weight management program for your pooch. 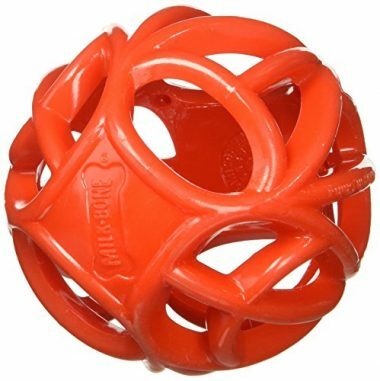 The idea behind a canine puzzle toy is that your dog should work to get the food inside. You can throw the contraption and your pooch will be running after it. You can have it bounce and your hound will be hopping along. The best part is that whenever they play or interact with these gadgets they are rewarded with a doggie treat or some tasty dry kibbles. The point is that you can actually make exercises more fun and nutritious, too. How long can you remain seated doing absolutely nothing – no texting, logging onto your social media account, no watching streaming videos, no listening to music, or any other activity? Can you last 5 minutes? 10? 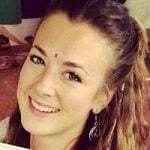 30? A couple of hours? Chances are you will still be looking for things to do. Now imagine your dog that is left in your home for a good 8 to 10 hours from the moment you go to work to the time you arrive home. They will definitely grow bored, too. Providing them with toys while you’re away can help minimize their boredom. Now add doggie treats inside these toys and they will have more reasons to be happy. This is almost similar to the above benefit. An idle mind predisposes your pooch to canine anxiety, too. Giving them something to keep them preoccupied can help prevent anxiety. There is a rather controversial benefit of using puzzle toys in dogs. However, it is very much plausible owing to the fact that the greater the amount of mental stimulation the lesser is the risk for the development of canine dementia or forgetfulness. The reason is simple. The more brain cells that are active the better is the transmission of electrical signals. Since these neurons are used efficiently, they don’t undergo degenerative changes. At any rate, you will be slowing down the symptoms of forgetfulness in your senior dog. Now that we have an understanding of the need for and the many benefits of puzzle toys for dogs, it’s time to gain a little understanding on how you can teach your canine friend to use its own puzzle toy. As in any dog training exercises, it is imperative to get your pooch really familiar with the puzzle toy. It must look at it as a normal part of its everyday existence. That being said, simply adding the toy to your dog’s collection of toys without necessarily using it yet can help in this case. Once your canine friend has grown accustomed to the presence of the gadget, you can start introducing treats into the device. You can always start with smaller portions of its favorite doggie treat then work your way up. Sometimes you really have to demonstrate to your dog how to perform the solution to the puzzle. For instance, you can ‘bat’ or swipe the puzzle toy in the presence of your dog. Or, if you have a pooch that already knows how it’s done, you can bring your inexperienced hound to the experienced pooch for it to learn. Whatever you do, it is imperative to pick a puzzle toy that is relatively easy to obtain the food inside. You can choose toys that have bigger holes so treats are easily dispensed. As your dog’s confidence grows, you will then have to provide it with more challenging puzzles such as those that come with sliding doors and the like. Choosing the right food puzzles and toys for your dog is crucial to ensuring they get all the benefits of such contraptions. Here are a few things that you really need to consider when buying a food puzzle and toy for your canine friend. You really need to consider the size of the gadget you want to buy. Your pooch should be able to put its mouth onto it without the risk of swallowing and suffocating. Don’t give a small puzzle toy to a large breed as it might swallow this contraption and block its throat. Don’t get something that is too large either as it can be quite frustrating and painful for your dog to open its mouth as wide as possible. If you have a mighty chewer, then you need a toy that’s made of indestructible materials. If your pooch has a rather soft bite, then getting a toy with softer construction makes perfect sense. We explained above that you will need to pick toys that allow your canine friend to succeed. It is for this reason that you may have several pieces of puzzle toys in varying levels of difficulty. 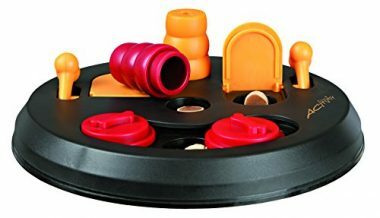 You will need to start with larger holes and slowly progress to more complex puzzle toys and feeders. Puzzle toys for dogs are largely predicated on their natural instincts to hunt or look for food. Understanding this fundamental reason to why they seem to love puzzle toys is crucial to appreciating the many benefits provided by these types of doggie toys. 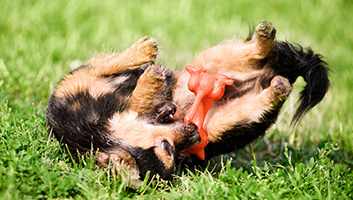 In choosing the right puzzle toy for your dog, you will need to choose an appropriately-sized device as well as one that is durable and sturdy relative to the bite strength of your pooch. The level of difficulty of the toy also needs to be considered. All in all, you can start training your pooch how to use this type of toy by choosing one from our list of the best dog puzzle toys to keep your pet busy.